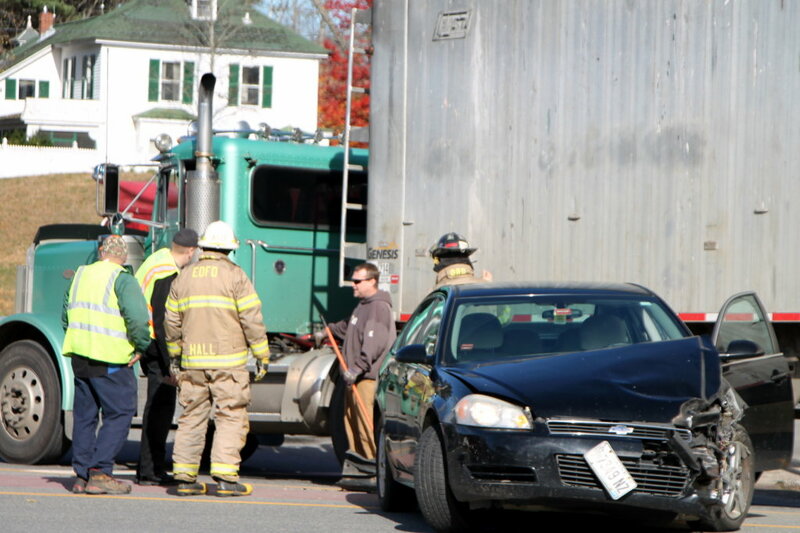 WILTON — A woman was taken to a local hospital Tuesday morning after her vehicle collided with a tractor-trailer truck at the intersection of U.S. Route 2 and Route 156. Wilton Police Officer Brian Lynch said a green 1999 Peterbilt tractor-trailer owned and operated by Jeremy Rose, 42, of Wilton was stopped on Route 156 heading west. A Western Express tractor-trailer was heading north on U.S. Route 2 and preparing to turn right onto Route 156. A black 2010 Chevrolet Impala driven by Bailey Gilboe, 20, of Jay also was traveling north and turning onto Route 156 east. “Gilboe didn’t understand tractor-trailers make wide turns and thought the Western Express truck was going straight. She tried to cut in between to make the turn,” said Lynch. “When she realized the truck was turning, she slammed on the brakes, lost control and slammed into the side of Rose’s truck,” Lynch added. The Western Express tractor-trailer was not involved in the collision, Lynch said. Gilboe sustained minor injuries and was transported to Franklin Memorial Hospital by Northstar EMS. Lynch said the scene was cleared within a half hour. The road was not shut down while the scene was cleared, he said. Wilton and East Dixfield fire departments assisted at the scene.